Piece and Quilt with Precuts is a fantastic book that helps you use all of those precut bundles you have accumulated over the years. I know I have entire drawers dedicated to charm packs, and shelves filled with 10″ square packs and jelly rolls. Don’t even get me started on the fat quarter bundles! In addition to 11 quilt patterns, there is also suggestions and 18 lessons on how to quilt them using your walking foot, free motion setting or a combo of the two. So Christa pretty much covers all the bases from the start of a quilt to the finished piece. To show off one of the patterns in the book, I decided to make two blocks from the Twinkling Diamonds pattern. Normally there would be 31 blocks measure 8″x12″, but due to other obligations, I couldn’t finish a whole quilt. After making my two blocks though, I’m kind of tempted to come back to this at a later time and make all 31. They went together so nicely and the instructions were very easy to understand. Due to the large block size, a finished quilt top wouldn’t take you very long. So it would be a very satisfying finish. For my blocks, I added extra fabric around the edges so I could make these in to a set of pillows for my couch. I haven’t quilted them up yet, but I’m totally following the suggested quilting motif shown in the book. It really is perfect for these blocks. I’m not too great at free motion quilting on my domestic machine, but luckily all her designs can easily be done on a longarm too. Middle Section is one of Cotton and Steel’s basics called Sprinkle in Jelly Bracelet. Outside Section is my own abstract design from Spoonflower. Middle Section is Cotton and Steel / Alexia Abegg called Moons Pink. Outside Section is Cotton and Steel / Kim Kight called Little Pill Dot in Ice Blue. Bonus: The pattern was written in such a way where even the leftover pieces were ready to go. Look at this awesome half square triangle pile I ended up with! I’m thinking they need to be a third pillow to go with the bunch. You can find Piece and Quilt with Precuts on Amazon, Martingale’s website and a SIGNED COPY in Christa’s shop. Christa and Martingale are giving away one digital copy of this book to one of my readers! I will be adding a digital copy of my Pixelated Circles Quilt and Spinning Icosahedron Quilt patterns as well. All you need to do is comment below telling me your absolute favorite fabric that you don’t think you could sew without! One entry per person, period. Any duplicate entries will be deleted. This giveaway will run for one week and will end Midnight Sept 1st EST. I will choose a winner within a few days of the end and get all of the important information at that time. This is open to all international readers as well since the prizes are digital. This entry was posted in Quilted, Sewing by jesseesuem. Bookmark the permalink. I always need Kona Snow at hand. I have a collection of cream-on-cream prints from different designers and manufacturers that I always reach for when I need a background. I love the slight texture from the tonal print. Thanks for hosting the giveaway! I love anything from Kansas Troubles. I’m partial to those browns, golds, greens, and reds. These turned out so beautifully! Thanks for being part of the hop! For the Block of the month at the Guild meetings we were requested to use Kona White so the blocks would be go together nicely in a quilt and I have been using the white in other quilts with good results. Kona cottons are my go-to fabric. Kona solids are on my must have list. I love working with batiks. Thanks for sharing the great giveaway! I can’t live without my Kona cottons! I must have Halloween fabric in my stash. There almost always seems to be a Halloween quilt on the go. I recently did a quilt top in all Halloween batiks and those fabrics are my favourite. I don’t have one favorite fabric. I just love fabric in general. : ) I do especially like working with batiks and I also keep a collection of white on whites that I like to use as background fabrics. Your blocks are so pretty. My must use fabrics are batiks. Thank you for sharing your project. Beautiful blocks! I love Kona cottons, but also need my Cotton + Steel! Such a neat Block! Thank You for sharing on your Blog+this Giveaway!!! Just give me cotton with a gorgeous print. It can be batik, or Civil war, I do not care. Just so long as it speaks to me, I am happy! Your fabric choices are amazing. I have learned to love grey, look at yours and how wonderful it looks. Those will make wonderful pillows! I might do that in my living room, because it could use some pillows. I am anxious to use some kaffe fassett fabric I have. It is so pretty. I’ve had it a few years and know I need to use it next. 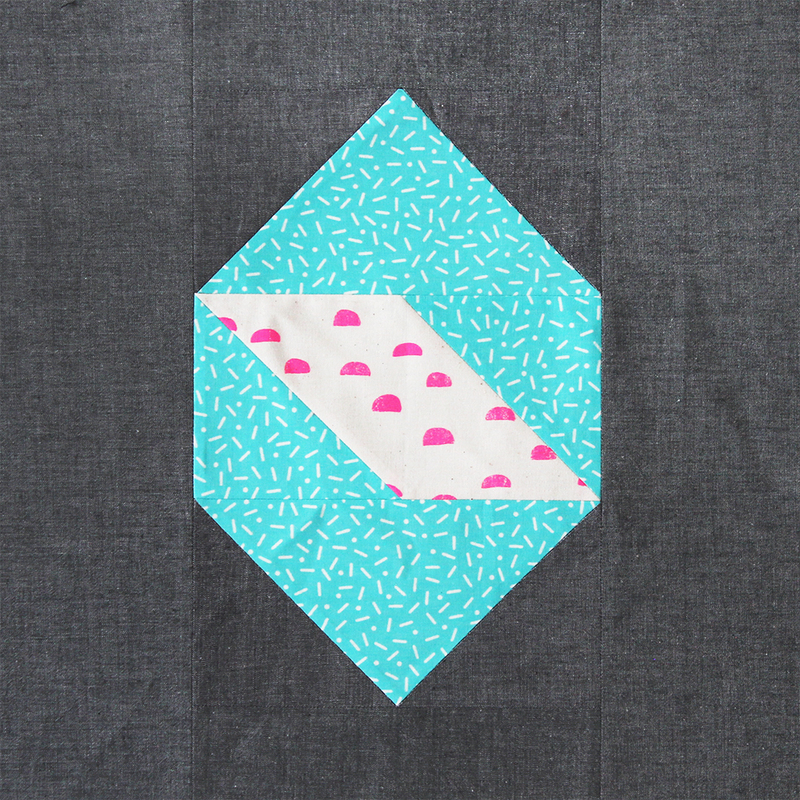 I *love* your great fabric choices for Christa’s pattern! I can see why the Chambray in black is your favorite fabric to sew with… It does go SO perfectly with the modern, bright colors that I love, too! (sigh)… I’m afraid if I have to have just ONE answer to “my favorite fabric to sew with”… I’d have to say, “cotton”!!!! Neutrals! I always have an assortment of neutrals on hand, whether they are left over from another project or bought new. I absolutely could no sew without them. My absolute favorite has been Kona Ash but I’m starting to move toward Kona Snow. I don’t really have one fabric I can’t live without, but I am a total sucker for novelty/ juvenile prints. I love this block, and they will make lovely pillows! My favorite design team is Sweetwater, hands down. But, if I had to pick one fabric, it would be navy modern herringbone by Joel Dewberry. I really love grunge fabrics! I don’t have a lot though…keep wishing I could find them on a great sale and then I’d buy a bunch! Thanks for sharing you blocks. My favorite is Kona white or pewter! Thank you. I love your colors. I have so many favorites. I can’t pin it down to just one. I can’t live without white Kona cotton. I use it for thread sketching and multimedia quilts. Like many others, my go to fabric is Kona Snow. Recently, though, I have been looking at various shades of gray – trying to find a true gray without the overtones of another color. Love the twirling diamonds, but that block may stretch my beginner skills, so I’m planning to start with one of the simpler designs. I cannot live without Kona cotton in grey! I suppose textures and solids. I love gray, white and cream for backgrounds. My favorite fabrics are batiks, but my background fabric is almost always white. Love your blocks! The dark gray really sets them nicely. Must-have quilting fabric is light colored neutrals in all sorts of prints. I tend toward scrappy quilt tops but I am currently working on a quilt that is all solids. Though I do enjoy piecing the solids, I sorta miss my scrappiness. I use a lot of Kona Cotton Snow in my quilts. I really love Christmas and holiday prints. I would hate to not be able to buy them. I love Essex linen. Thanks! I love Kona solids and couldn’t quilt without Kona Snow. For years my go to fabric has been Kona Black. But more recently I’ve been branching out and using lighter backgrounds in several things. I love to sneak a little bit of a black and white 1/4″ check into a quilt. Always like to have Kona Black on hand. A little pop of black here and there are what might be needed. I love this pattern – I’d love to make a quilt! I haven’t been quilting long enough to have a favorite fabric, I think. I love purples, blues, and greens. Theses colors catch my eye and I’m hooked. I couldn’t live without my Kaffe Fasset fabrics! I really love my batiks. But I always love having some basic whites on hand. Modal solids are my very favorite. Always the right shade you need. Well there are several fabrics that I love to keep in my stash but one that I love mostly is Moda Grunge. I get excited every time I see a new Grunge color. Loving this diamond block.